This information page will help you choose the right product for your project or application and be informative so you can learn what each product does. FIS Bobtail Connectors provide a pre-polished, & ready for field use quick termination style connector for an industry leading value. Bobtail’s are ideal for many applications including, but not limited to, local area networks, restoration work, testing applications, and laboratory settings. Reduces field termination time by up to 90% and no special tools required. An optical time-domain reflectometer (OTDR) may be used for estimating the fiber’s length and overall attenuation, including splice and mated-connector losses. It may also be used to locate faults, such as breaks, and to measure optical return loss. To measure the attenuation of multiple fibers, it is advisable to test from each end and then average the results. The Cheetah SOC™ is the quickest pre-polished factory terminated pigtail to prepare, splice and install. It's 27mm splice protection sleeve is encapsulated and protected by the strain relief boot eliminating the need for splice trays, chips and extra cabinets. 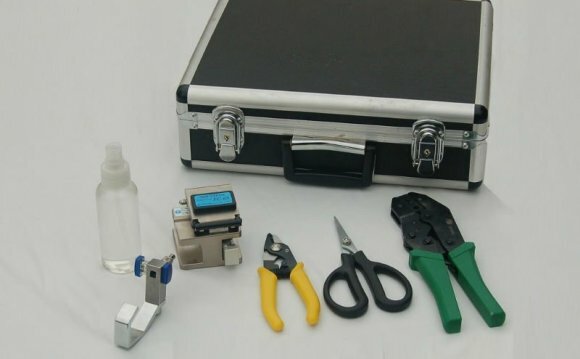 Fusion splicers are tools that use a controlled electric arc to fuse optical fibers to one another, creating a non-reflective connection from one length of fiber to another. Fibers are aligned by one of two methods: V-groove alignment and core alignment. Attenuators are passive devices that reduce the power of an optical signal. They are commonly used for two main purposes, to test power margins of a net work or to match signal strength to acceptable levels for active optical equipment. Attenuation can be induced on the fiber or in the free space between connections. The majority of fiber optic connectivity needs fall within a range of connector styles and lengths. Used to connect switches, transmitters, receivers and trunk cables, ST, FC, SC and LC patch cables between one meter and ten meters long are typically available. Patch cables are built from bare fiber, PVC tight buffer, Kevlar yarn and a PVC outer jacket. FIS Mechanical Splices hold fiber with a self-gripping clamshell design. These unique splices also allow for the optional use of cyanoacrylate adhesive (e.g. Super Glue) to achieve a superior pull strength of 1.5 lbs. Custom fiber optic cable assemblies are used when an off-the-shelf patchcord will not meet the connectivity needs of a project. Legacy connectors, large-core fiber optics and multi-fiber assemblies are typically built to order and so are long and hybrid patchcords. This fusion splice protection sleeve is durable, competitively priced and easy to install on fusion-spliced optical fibers without requiring heat, curing, crimping or gluing. No need to wait for heat ovens that often hold up splicing, or breaking a splice because the heat protection sleeve was not pre-threaded prior to splicing. Cabling is an integral component of any optical network. Simplex cable construction consists of bare fiber coated with a PVC tight buffer, surrounded by Kevlar yarn and jacketed together with a PVC outer jacket. Duplex cable is a two-strand patch cable that functions very much the same way as simplex cable but is particularly good at grouping dedicated transmit and receive fibers together. Cleaning your fiber first can help you accurately troubleshoot your fiber optic network connection. So many times installers spend extra money and time replacing patch cords and cable runs when a good cleaning would have improved they transmission signal. An optical fiber connector terminates the end of an optical fiber, and enables quicker connection and disconnection than splicing. The connectors mechanically couple and align the cores of fibers so light can pass.